George A. Romero was not only the creator of the Zombie Horror genre, he was the inspiration for Kirkman’s The Walking Dead series. To ignore George’s impact on the horror genre at large, as well as the Zombie sub-genre, is doing him a great disservice. George A. Romero was not only the creator of the Zombie Horror genre, he was the inspiration for Kirkman's The Walking Dead series. To ignore George's impact on the horror genre at large, as well as the Zombie sub-genre, is doing him a great disservice. He may not have been a fan of this series and he even said The Walking Dead was "a soap opera with a zombie occasionally" but George also stated "My stories are about humans and how they react, or fail to react, or react stupidly. I'm pointing the finger at us…" And point a finger he did, and we continue, for good or ill, to reap the benefits of that finger pointing. The Walking Dead Series has taken his precept, not only to heart but to the next level. Season Seven seemed to eschew the need for the ubiquitous undead and instead focused almost entirely on the humans, and in this season there is a glut of them, reacting, failing to react and definitely acting stupidly. Yet for all of their faults, the characters that we have come to love and especially love to hate, drive the story forward. Picking up immediately after the thrilling cliffhanger, Negan forces Rick and the group to fall under his will, brutally convincing them to live by his rules. To prevent further bloodshed, Rick genuinely believes they can make life under Negan, however terrible, work. But he soon learns that Negan can't be reasoned with, and they must prepare to go to war now. Victory will require more than Alexandria, and Rick will need to convince their new allies from the Kingdom and Hilltop to band together with the common goal of taking down Negan and his army. I'm going to make the assumption that if you are reading this review you are well versed with The Walking Dead universe and are simply interested in hearing about whether or not you should slap down your hard-earned cash for this set. The simple answer is, if you're a fan and completest, yes. The Complete seventh season comes with 5 discs: 4 containing all episodes (obviously) + 1 special features disc. The Special features include hours of never-before-seen bonus features including, deleted and alternate scenes, audio commentaries as well as nine featurettes showcasing behind the scenes clips of the show. I especially enjoyed Inside "The Walking Dead" and its episode-by-episode breakdown; The Writers of the Walking Dead as well as "A New Chapter of Fear". Especially poignant is the "In Memoriam" featurette, where the cast and crew say their final farewells to those that were lost. The Audio/Video is what you would expect: 1080p * 16X9 Widescreen 1.78:1 Presentation English 7.1 Dolby TrueHD, including Digital HD for those that need to watch it all from the comfort of their tablet or cell phone. The show itself is shot on 16mm and the transfer to Blu-ray complements the film with a great sense of clarity as well as a graininess which is not so much of a flaw but adds to the realism and grit that is part of the aesthetic of the show. The colors are vivid and the blacks are inky and deep and there is an overall clarity to the environments as well as the human and zombies faces. The Audio in the surround presentation provides a great amount of ambiance and not to mention the sounds of gunfire, explosions and even the tiger's growling and Zombie moans all add to the depth of the experience. This season has never looked or sounded better. The set even came with a mini-catalog of Walking Dead swag, from backpacks to hot sauces, TWD marketing train never stops. Keep in mind the almost $40 price tag may be high in these apocalyptic times, but there's enough meat on the bone in this set to keep even the most ravenous zombies fed until October 22nd rolls around. 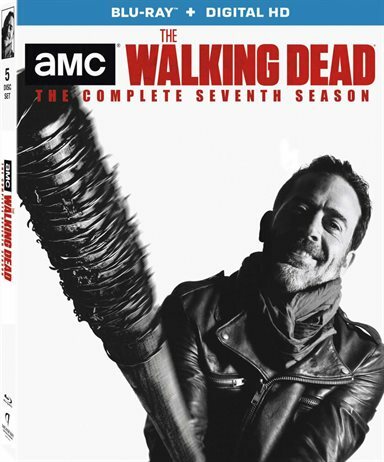 Download The Walking Dead: The Complete Seventh Season from the iTunes Store in Digial HD.